There is a paid version which has no ads. If you like this app and you want to support us please buy the paid version. 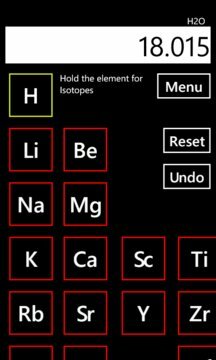 A neat little chemistry aid that includes so far: a Molar Mass calculator (w/ Isotopes), a very simple calculator, and Chemistry reference sheets. The reference sheets include equations, constants, ions, etc. For many people, calculating molar mass is a hassle since you have to look at a periodic table and then punch it into a calculator to add. 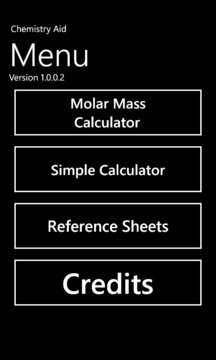 This app will ease that pain and allow you to calculate Molar Mass quickly and easily.